Yes, itâ€™s cute and yes it unites a lot of stuff in a little box. 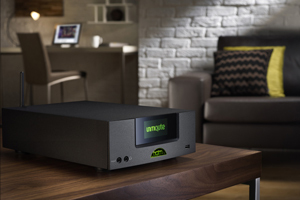 Weâ€™ve got an in-built amplifier with a very flexible preamp section (2 analogue inputs and 5 digital jobs â€“ 24/192 capable to boot) plus a superb FM/DAB tuner. You can plug your iPod into the USB socket but this input sounds even better with a nice high-res audio file from a memory stick. Oh, weâ€™ve also got an Ethernet port and Wi-Fi too so itâ€™s a perfect partner for the brilliant little UnitiServe. A pair of ProAc Tablettes or some Totem Arroâ€™s and your really in business.